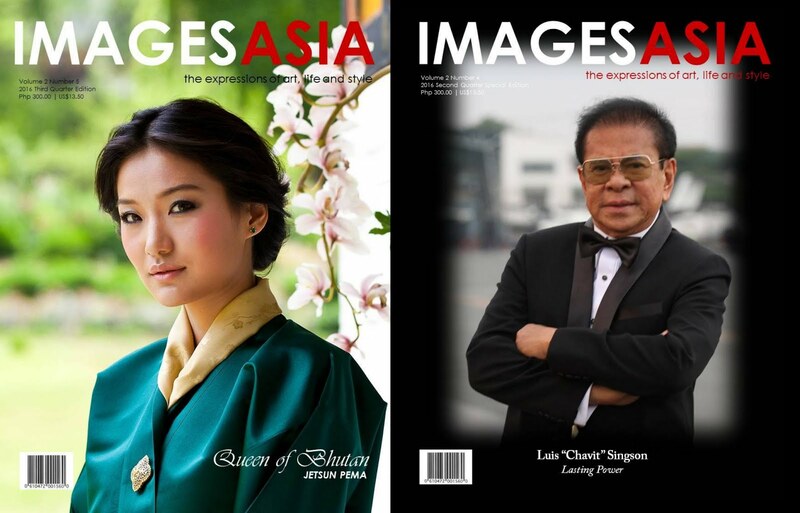 This 2016, I had the very great pleasure of being a part of the Images Asia personalities roster for article features on their international publication. 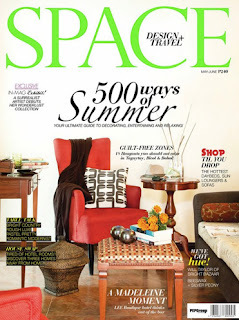 The brainchild of Ernest Gonzaga from the Philippines, Images Asia has worked with the likes of Luis 'Chavit' Singson (featured in the previous month's issue), Jetsun Pema; the Queen of Bhutan (our cover feature), and many more notable figures from across the Philippines and whole of Asia. It was an enjoyable and light-hearted session when we did the photography required for the magazine, as Mr. Gonzaga and lead photographer Ronin Urbina were down-to-earth and very accommodating to our group. We spent a great part of the afternoon having good conversations about modern life and the current situation of our country with regards to the elections and political personas vying for the presidential role. 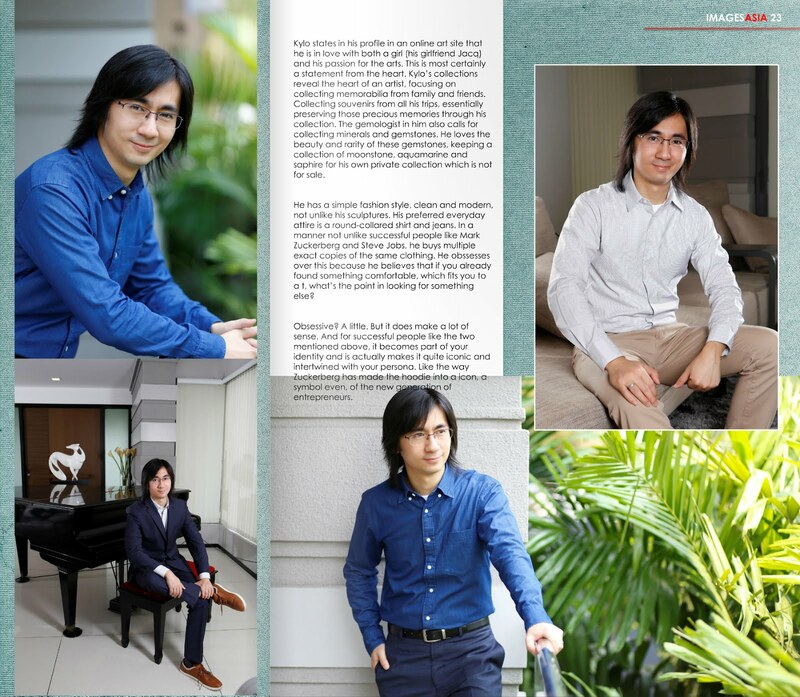 The shoot itself was professionally done, as it was a joy to work with the entire Images Asia Team and their production staff. My great thanks to the set-up catered by their preparation team- the lighting equipment was also full-on and beautifully arranged for all of us. 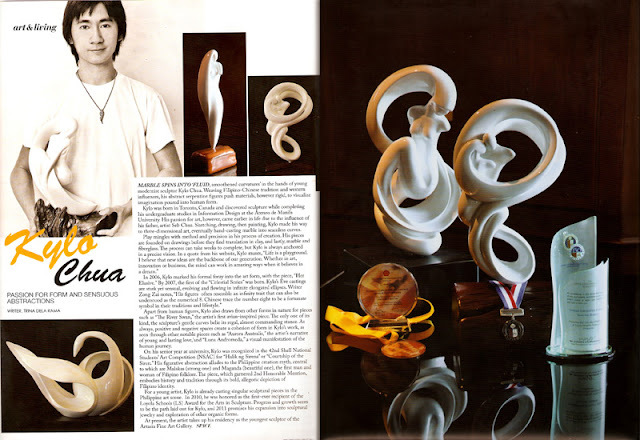 Sculpture has been one of the most defining practices of my life so far, with most of the media coverage featuring a center focus on my artworks in stand-alone fashion. This time's featurette was more of a look into my life growing up, from my highschool years at Xavier, into college life at the Ateneo de Manila, and eventually onwards to the upcoming progression of my plans as a modern sculptor and entrepreneur. Looking back into the past, I realize that I'm actually very blessed and thankful for the people in my life who have taken great care of me through their support and friendship. My family is also an incredibly supportive one, full of role models in many different ways. Hopefully one day I can repay the kindness and love shown to me by these people. A couple of months back, me and dad joined up with other Chinese-Filipino artists to take part in an exhibit that brought us back to the roots of our Asian heritage. Gulangyu island is a place that's familiar to many Chinese-Filipinos today. It's been a part of the numerous stories passed down from our taikongs and taimas (great grandparents) to our grandparents. 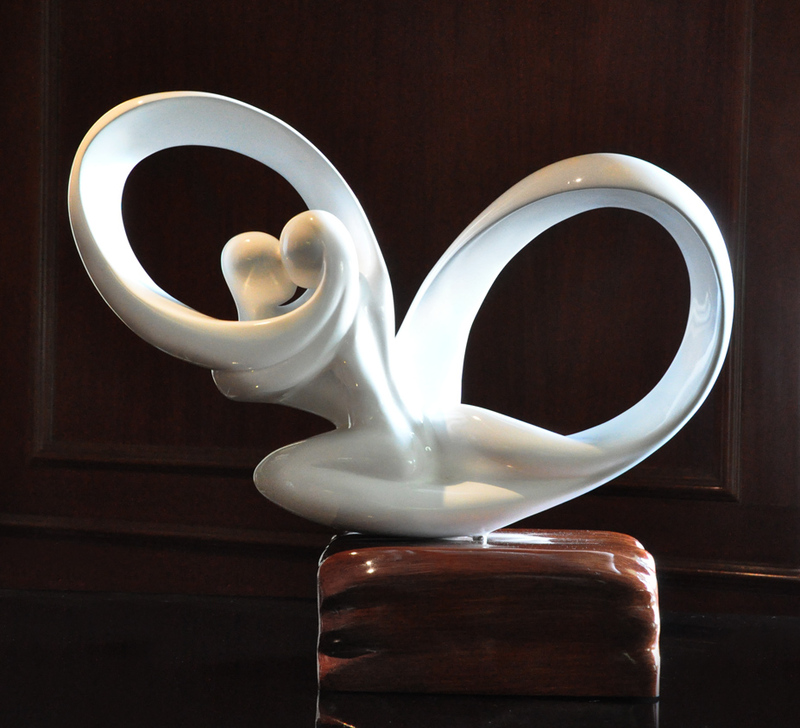 This exhibit was the brainchild of a new foundation for Gulangyu island and the heritage it represents. It was held last June at the Robinsons mall, with the help of the Gokongwei family (who also have roots from this historical island). The show was a first of its kind, aiming to educate the younger generations and expose them to the intricacies of their ancestors' homeland. Unfortunately, I was abroad during the opening night, so I have to thank the foundation and its supporters for the snapshots here. Our exhibit was also featured in the Philippine Star news, with generous content from some of our friends in the Fil-Chi media community. 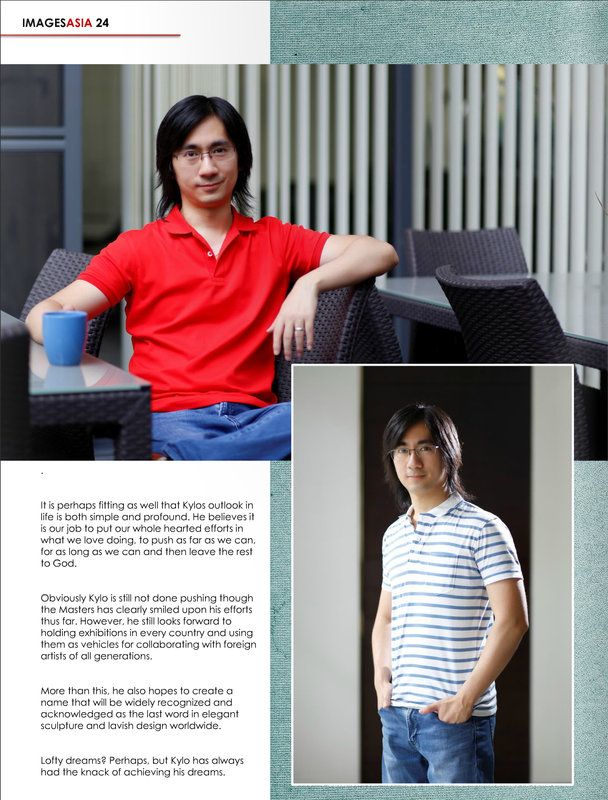 The Chinese Business magazine also published writings on the show with their July issue. In the article you can see some of the group's works and one of my past works; Dendrobium, which was also featured at the exhibit. Last week I had the opportunity to come across the photography skills of my friend Jeri Barrios. 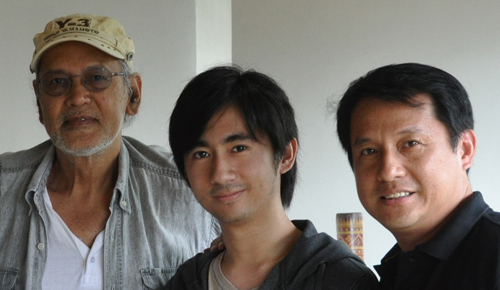 Together with my dad Seb Chua, We did a studio session using a couple artworks from 2011-2012. We brought about ten artworks to be photographed and got ourselves in the photo series too. While sculpture is the most familiar art form I relate to, photography isn't a stranger in the neighborhood. From my early college years up to now, I've been able to make use of this widely evolving media in many of the graphic designs I've developed for my artworks. This time however, Jeri's expertise in the photography of people came into perspective when he was able to produce a good collection of profile and fronting shots with us and our works as his subjects. I'd say the experience went very well, considering that we only made use of the afternoon to do all the photography work. He tells me that his appreciative affinity towards photographing people stemmed from his journey as a model here in the Philippines. From what I observed, Jerry's knowledge about lighting, positioning and overall taste is quite exceptional. 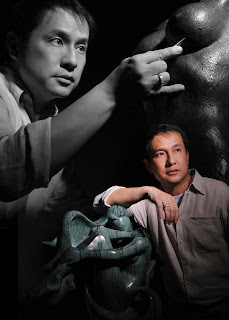 He was also able to apply what he knew to the photography of our sculptures as well. Some of Jeri's photographs are here on this post, however you can see more of them at by visiting this link. 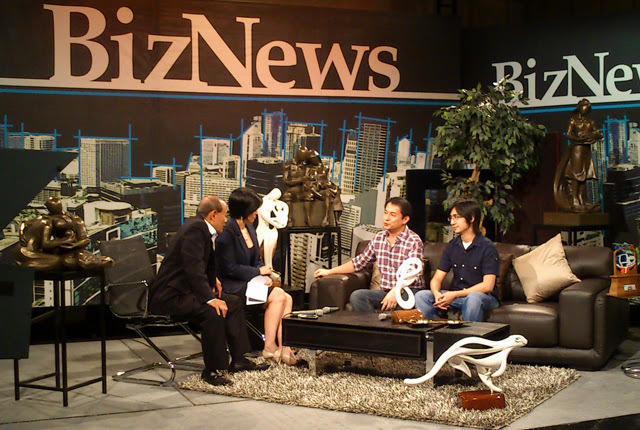 Yesterday, my dad and I were invited to a light-hearted interview with BizNews, to talk about sculpture and the business of art. Tony Lopez and Elizabeth Dee hosted the show and were very hospitable to us, supporting an amiable friendly chat about how we create our works. We discussed a little bit about the current situation of Filipino art as well as the growing demand for art in Asia. China's artscape is tied to its rising economy (my dad discussed) as we noted Chinese artists whose prices have gone quite high in the recent years. The Philippines is a more freeform, radical art community with a lot of potential, though a lot of artists are being tempted to live abroad to find the "promising dream" of the first word mentality. Sculpture in the Philippines is a relatively re-emerging media (especially when we spoke about modern art). Painting has been a more historically oriented endeavor with Filipinos. Despite this fact, it can be seen today that the rise of mixed media and sculpture is straight ahead, with more and more art galleries exhibiting three dimensional works as main features in their shows. The turning point for the evolution of Filipino and Chinese sculpture in the country is near though. 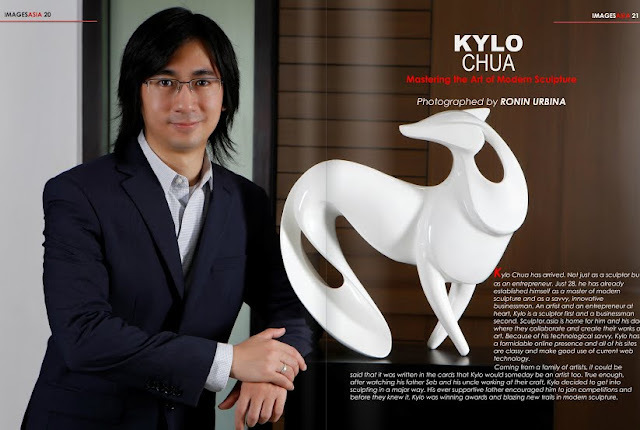 With contemporary artists and modernist sculptors leading the way into a new generation of Asian masters. During a brief moment I also talked about following the aesthetic elements of sculpture in the field of jewelry, making and orienting pieces to aesthetically embody abstract art. The classic jewelry trade I believe, can still evolve to a more hybrid type of luxury where personal / art-oriented value can even match material value (precious metals and gemstones). 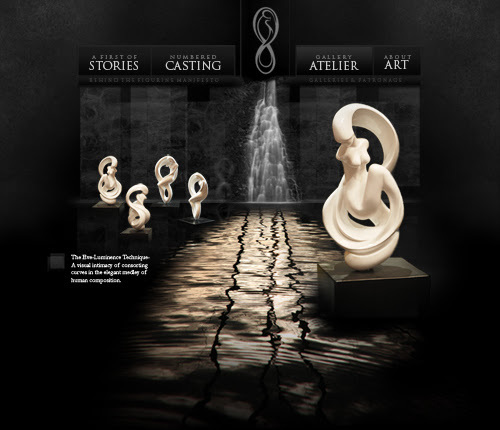 As a Filipino-Chinese sculptor and a student at the Gemological Institute of America, this is a movement I cannot wait to experience. The optimistic growth of innovation in design is bound to happen in the next few years. The latest one-off piece in my sculpture collection joins the River Swan (2008) as a tribute to the intensity of our natural world. This recent addition marks the first of my artworks for 2012. The Savannah portrays a captured moment in the sprint of an elusive cheetah traversing the Serengeti. A beautiful creature in its own right, the cheetah holds the crown for being the fastest land animal on our planet. I chanced upon the idea for this sculpture after a moment of pondering on the ability of today's cameras to literally stop time and showcase motion through stills and frames. I believe photography to be a media of curiosity, and am an avid fan of the art. With that said, my tendency to experiment with my own media drew me closer to the subject of "motion". What better way to see the notion of speed than to view the fastest creature on earth in mid-stride? I quickly took to my sketchpad and started creating the flat base drawings for my first cheetah sculpture. 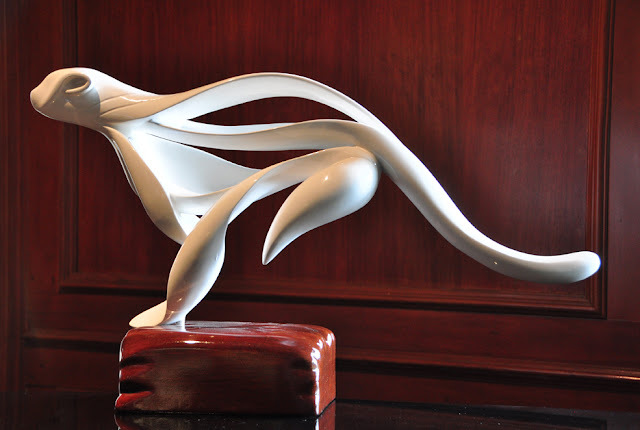 The unique balancing of this piece strikes at the subject's own state of being. 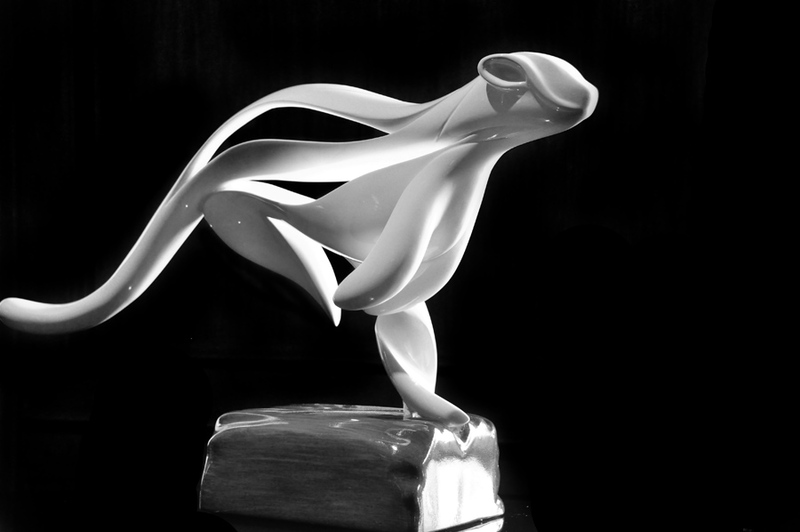 Motion is a tricky thing to sculpt, just as momentum is a rare tenant in some excellent photographs. Here are some pictures I took just after Savannah left the studio. Through the long course of this artwork's journey, I proceeded with a tempered aesthetic view on its final look and motif. I love the play of white against black in the layout and I'm really happy about the idea of my sculptures being up in the air (so to speak, since it's an Inflight Magazine). All in all, I'd like to thank Jericho and Selena, as well as Silk Air for featuring my work in their well respected magazine. 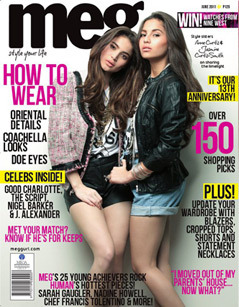 Great job on the cover as well if I may add. 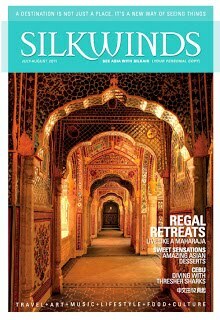 It makes me want to travel abroad to visit and tour the Maharaja's exquisite palace... (daydreams...) If you would care to view the pdf of the magazine, it can be found here. It takes a short while to load the pages, but they make it so that it looks like a real page-turn type of magazine on your window. Silk Air is a Singapore-based Airline that is the sister brand of Singapore Airlines and responsible for around 60 percent of the company's Asian and regional flights. This June, SPACE Magazine's quarterly design and travel feature came out on the shelves of bookstores around Metro Manila. 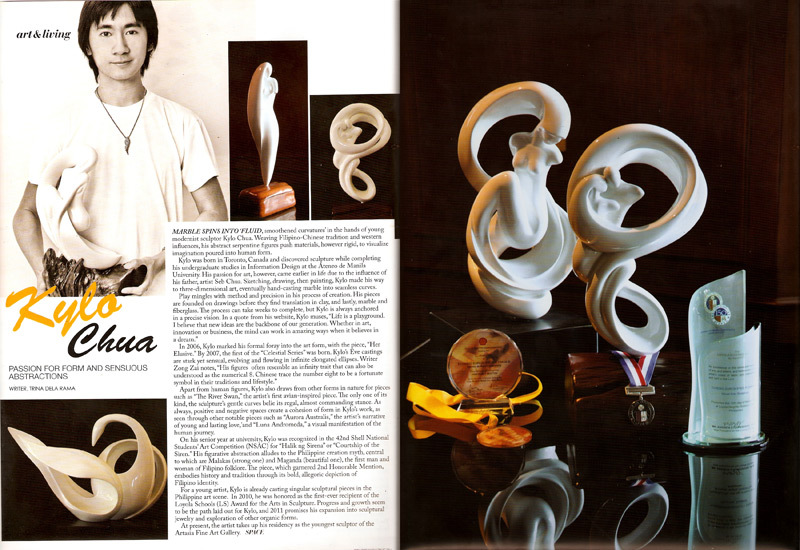 Dad was the first one to see the feature they wrote about me and my artworks. To be honest, I'm quite thrilled to be a part of such an elegant production- from photographic quality to layout, their magazine speaks a good luxurious feel through the line-up of well written articles and interesting features. SPACE showcased a series of creative personalities in its select Art & Living category, among them were paper sculptors, mixed media doll artists and various innovative and creative individuals. To be included with these modern day examples of aesthetic progress is something I feel very appreciative of. 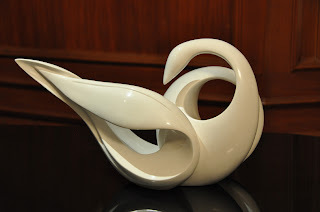 Throughout my life, I've loved the elegance of artforms wildly varying in theme, form and contour. 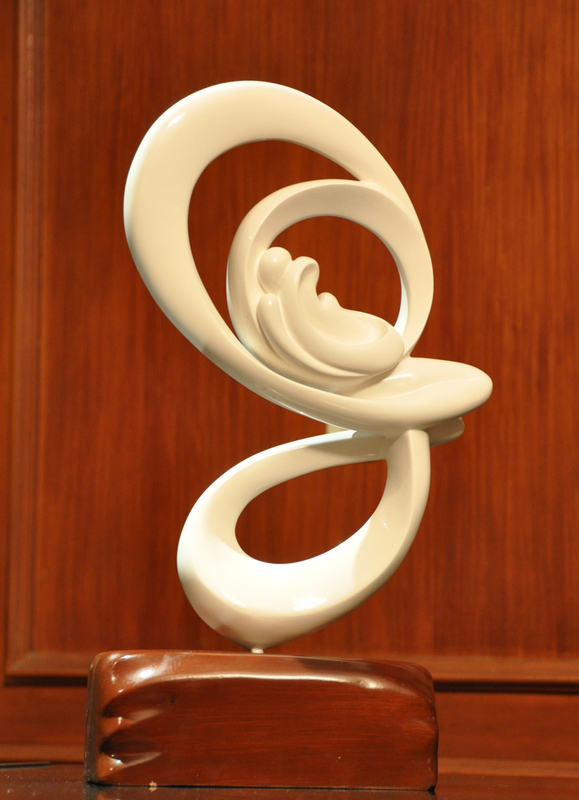 To think that my sculptural works have been recognized by others gives me a sense of great fulfillment indeed. A special thanks to Hannah Galang, who's been a part of this endeavor from its core beginning, to my parents who rigorously support both my education and my artistic passion. 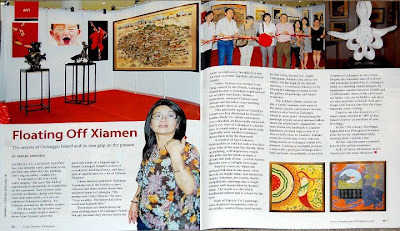 After the successive visits to the XAG exhibit in Gateway, a lot of interesting things happened this month. The studio is now a frequent reservoir for sculptures before they are shipped out to different events/venues for exhibition. The limited edition pieces are doing better than I expected, so I'm working on new designs for those as well. I'm happy that my passion in art hasn't gone to waste. I know that it's pretty fortunate for me to turn my interest into what it is today. I'm very thankful to everyone who's been supporting me all this time too.. Dad brings me to far off places everyday to learn more about goldcasting. Mom supports me by handling a lot of accounting work and finding tools that I could make use of for the new studio. Despite all the stress and hardship that people don't often see, I'm very glad I have friends and family to back me up in my art endeavors. I thank God for always guiding my mind and my hands to do the best they can. It isn't an easy thing doing sculptures this way as some people may believe. It takes a long process and can sometimes step into your schedules and personal time, but that's what passion is. The best way to work is to work on what you love. 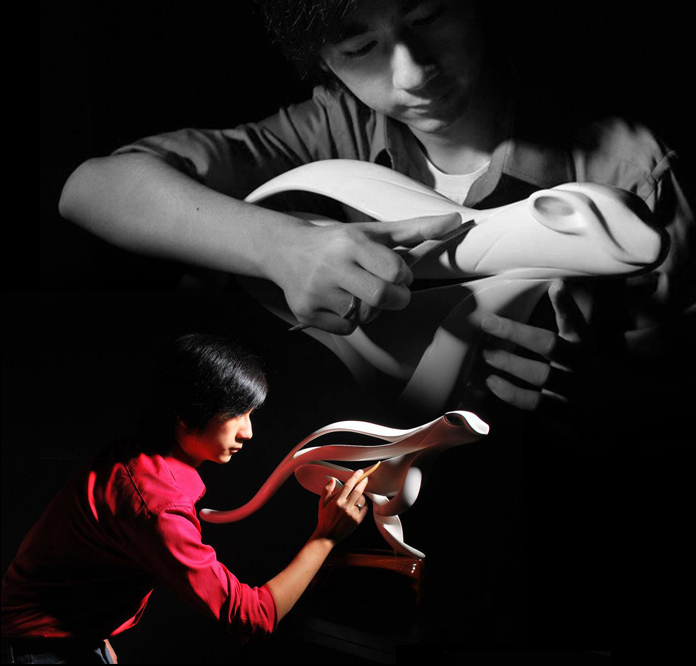 So far the sculptor.asia website has helped me a lot. Through that, I was able to get new clients, opportunities and even a scholarship in Los Angeles. It makes me happy that the things I've learned through my college years still help me in a lot of ways other than the advertising field. Whew.. this has been quite a month.. I'm really looking forward to June and the promise new time brings to the art scene. :) Keep being awesome everybody. 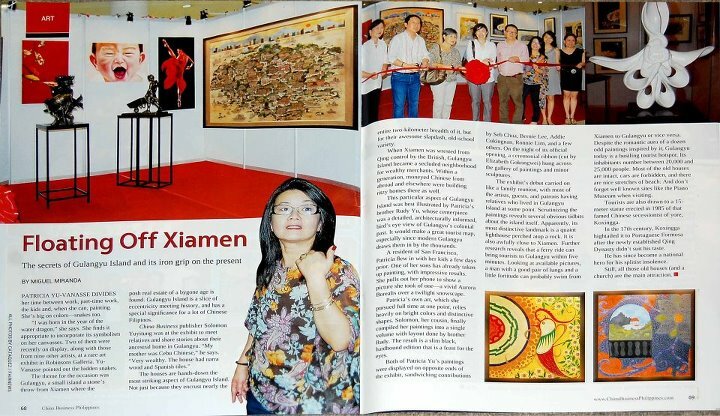 After the successive visits to the XAG exhibit in Gateway, a lot of interesting things happened this month. The studio is now a frequent reservoir for sculptures before they are shipped out to different events/venues for exhibition. The limited edition pieces are doing better than I expected, so I'm working on new designs for those as well. I'm happy that my passion in art hasn't gone to waste. I know that it's pretty fortunate for me to turn my interest into what it is today. I'm very thankful to everyone who's been supporting me all this time too.. Dad brings me to far off places everyday to learn more about goldcasting. Mom supports me by handling a lot of accounting work and finding tools that I could make use of for the new studio. Despite all the stress and hardship that people don't often see, I'm very glad I have friends and family to back me up in my art endeavors. I thank God for always guiding my mind and my hands to do the best they can. These days, my sculpture practice has been taking on some new learning curves. Experimenting with white metal is no easy procedure. I've actually burnt my fingers more than ten times in the past two week of metalworking, but the discoveries that were unveiled through the process was well worth the hardships. 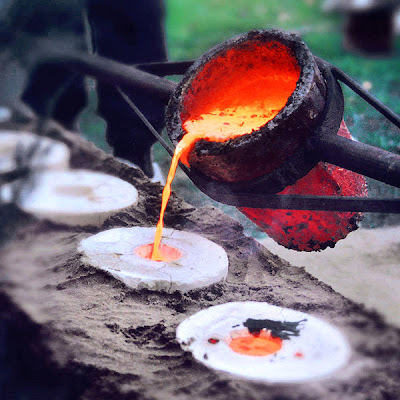 Metal-casting is much different from casting marble (as I frequently do with my modern sculptures). For one thing, cold casting will not work here. You will need to administer extreme heat and pressure to be able to even form the basic contour of a design. Obviously the casting machines used are also different. 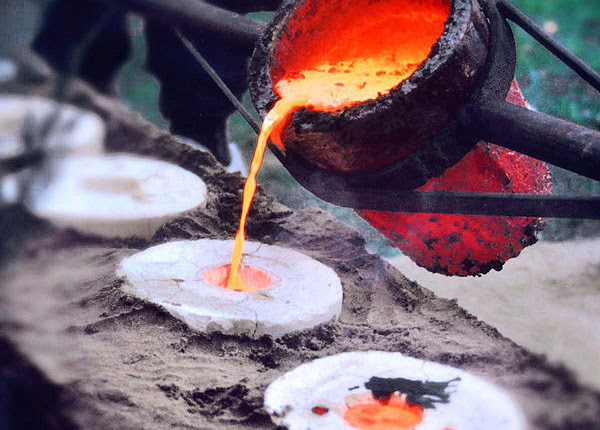 Centrifugal casting and Vacuum casting are precisely timed techniques that make use of high-grade materials to cast molten alloys. I'm amazed at the aesthetic and design capabilities of metal media in art. The strength, durability and surface beauty are among some of the main factors I should now take into consideration when creating designs. Fabricating designs in clay is also much more flexible than wax-working designs, so I'm adjusting to the texture and surface durability of this new carving material as well. A new Dremmel tool helps me carve out patterns in the wax and refine them to a smooth state with an aluminum carbide tip. It's a real tough process, but I'm sure the sculptural endeavors produced with this new found knowledge will indeed exceed expectations. I hope to also cast mixed media sculptures someday- made of a hybrid combination of marble, glass and metal. 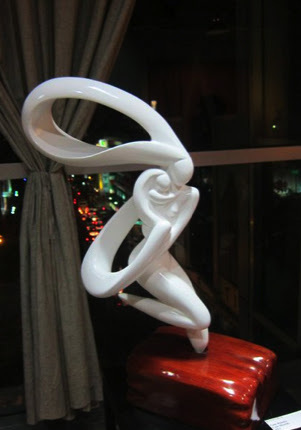 I believe there is a contemporary elegance to the use of hybridity in sculpture and I definitely want to find that elegance through my pursuit of technique and knowledge. 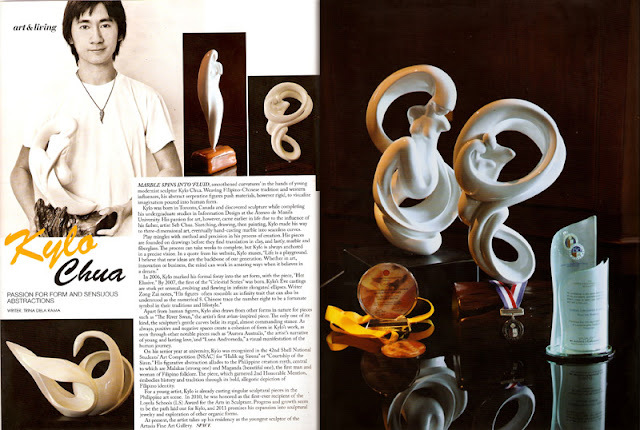 As a Philippine contemporary sculptor, I do wish to contribute to the country's innovation in the art circles as well. 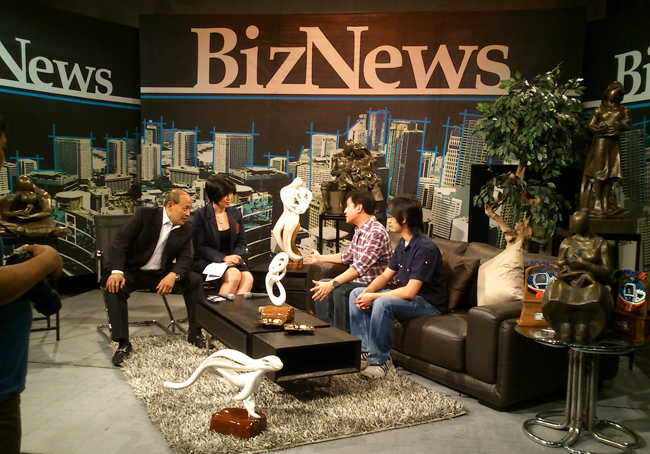 I want to make the Philippines known as a prime spot for art endeavors all throughout Asia and even the world. This is one of my dreams and passions that I keep in mind when struggling with heat, patience and endurance during sculpting sessions. Though currently in the middle of more discoveries, I'm happy to be learning and committing to more ways of visually manifesting my eve creations, as well as the new series of fauna subjects I'm preparing to roll out into the galleries. 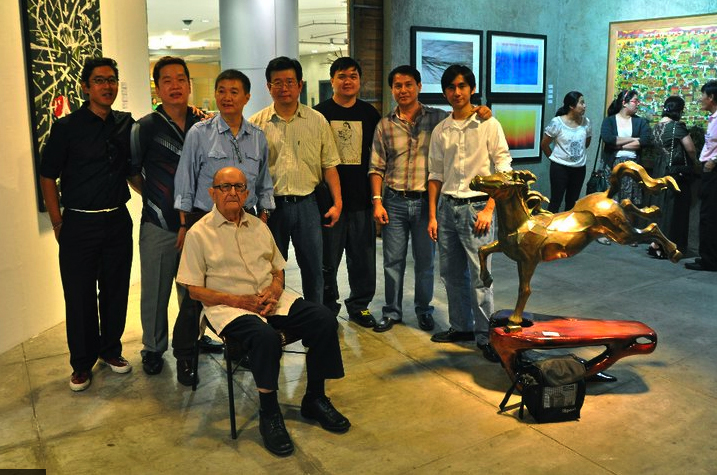 April 30th, 2011- the very first celebration of art for Xavier School's alumnus. Familiar faces like Fr. 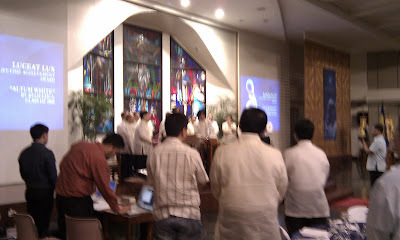 Zuloaga were present during official ribbon cutting to launch the month-long Luceat Lux exhibit. The paintings that adorned the walls of the gallery lit up with magnificent works of art. Rudy Yu's seven-foot long masterpiece attracted much attention with its detailed beauty and style. 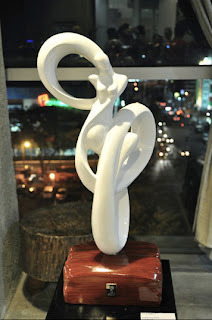 Mikko Sison's abstract creations also brought up the ambience of the place, with magnificent and vibrant depths. Seb Chua's bronze stallions set the night in motion with captured scenes of pure splendor and excitement. 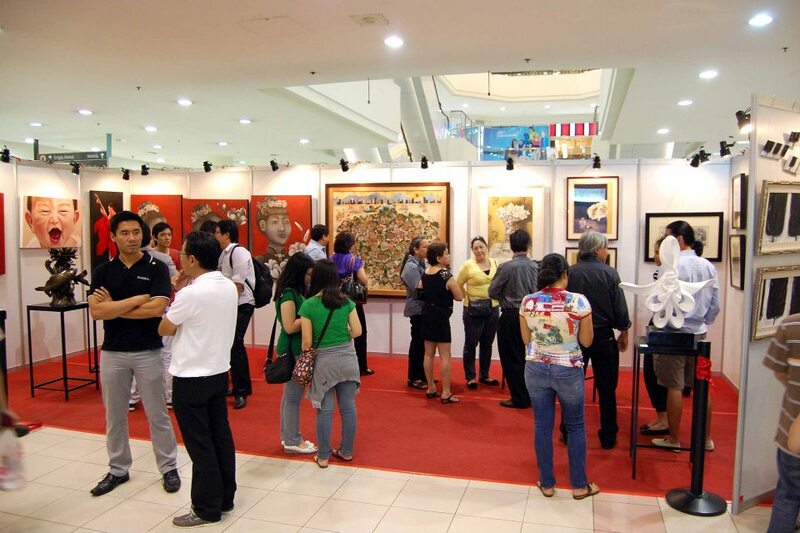 Many other painters were also able to showcase some of their most breathtaking artworks of 2011. 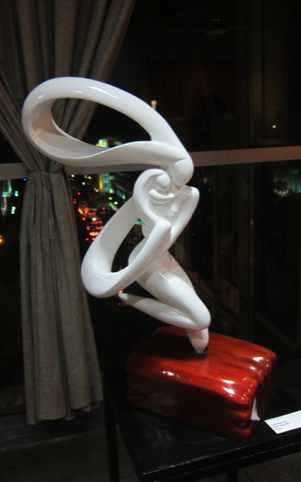 I was able to showcase about five of my abstract figure-artworks during the opening night. "The Gale Runner", "Infinite Perception" and two of my other works were also first appearances for the show. 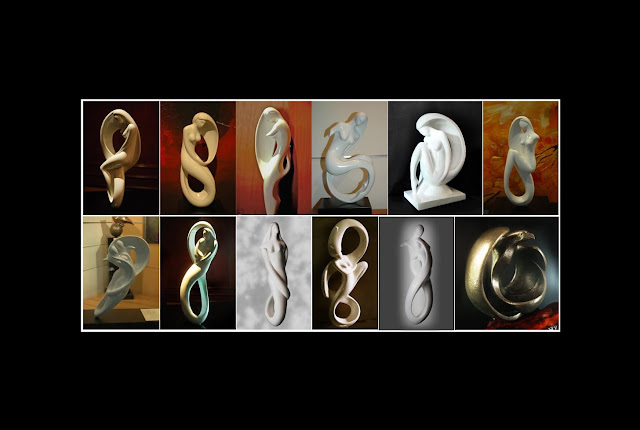 This line-up of one-off sculptures took me several months to complete in full. This special night was also blessed by our honored Fr. Zuloaga as he made his rounds around the venue, praying for the art and the artists alike. Aside from friends, family and Xaverians, several guests streamed into the gallery starting from 7:30pm. It was quite a sight to see a gathering of both close bonds and art enthusiasts all at the same time. I believe that the XAG has something unique to offer the community in terms of aesthetic growth and development. Creativity was not always something famous in Xavier School, but these days are turning the tides for a new wave of artists. We began as the first eight to start the movement, now our group numbers in nearly a hundred. 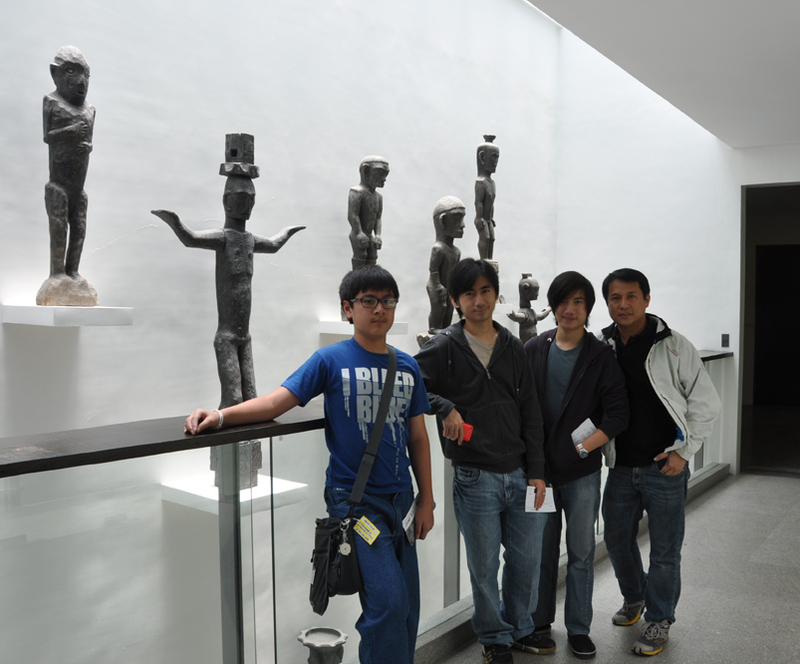 Next year's exhibition will surely mark a succeeding age in the continuity of our group's pursuit for the fine arts. There's something I've noticed about myself as both an artist and a designer. I never liked having to scrap past designs that didn't make the cut. It makes me feel bad about all the effort put into that project that never made it. Because I've never liked this feeling, I maintain a project-research folder that allows me to look back on many of my past creative outputs. This is very useful as a design practice because the originality and impact of a previous work can help you to manifest something similarly bold, but better in taste and effectiveness. The plus side to this method is that there wouldn't be any design infringement issues because the work that you are building upon is actually your own. Get into the habit of utilizing everything that you create, whether it be for research, building, compiling, marketing or other purposes, it is always better to keep in mind that all of this was generated by your creative energy. Anything that may not be appropriate for your project today, may very well be exactly what you're looking for tomorrow. Getting into the habit of storage and recycling old creative output will save you both time and effort, without compromising your design's overall working impact. 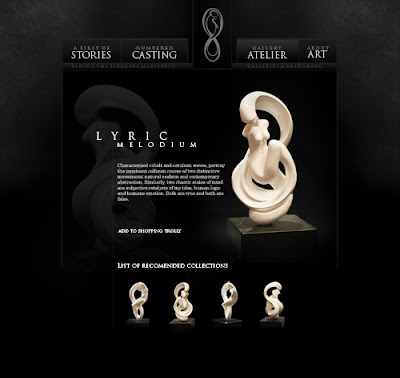 When I created www.sculptor.asia , I had several of my designs compiled into a working folder. I built on elements that I preferred and began to compose a website that was able to acquire the best elements of my previous draft designs. 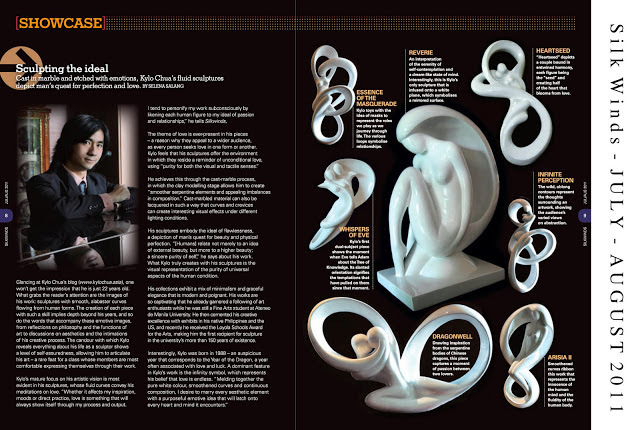 When it comes to sculpture creation, this method also works in a number of different ways. 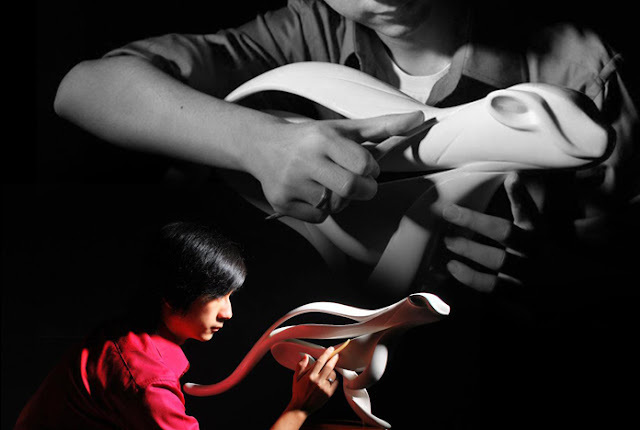 It affects the working process in two stages, the sketching / drafting and the actual clay modeling. Old sketches for example, may have parts or elements that are unwanted or inappropriate for your project, but they may also have other elements that are full of impact and would a great addition to another future design. I can take advantage of this knowledge by storing these sketch elements, combining them with one another or building upon them when creating a new design altogether. This design composing strategy can also be used during the clay phase when certain areas of the sculpture are blank thoughts in your head. This applies frequently when being unsure of the designs in less visible elements such as the back torso or legs of the figure piece. Greetings everybody. 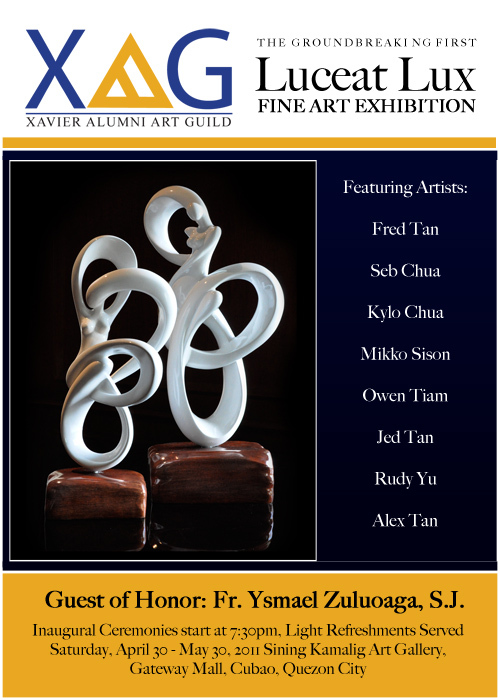 To follow my earlier post about the Xavier Alumni Art Guild, I'm pleased to invite all of you to join us in celebrating the very first fine art show of the XAG. The exhibit will run from April 30, 2011 to May 30, 2011 at the Sining Kamalig Art Galley located at Gateway Mall, Cubao, Quezon City. Among the participating visual artists include Fred Tan, Mikko Sison, Owen Tiam, Jed Tan, Rudy Yu, Alex Tan, Seb Chua (my dad), and myself. 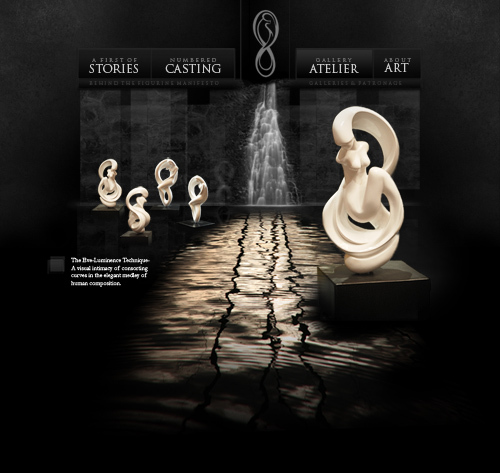 Around 4-5 major works will be seen from each of the artists. The inaugural ceremonies will be at 7:30pm at the gallery area. The XAG now has over 80 participating alumni in its roster. 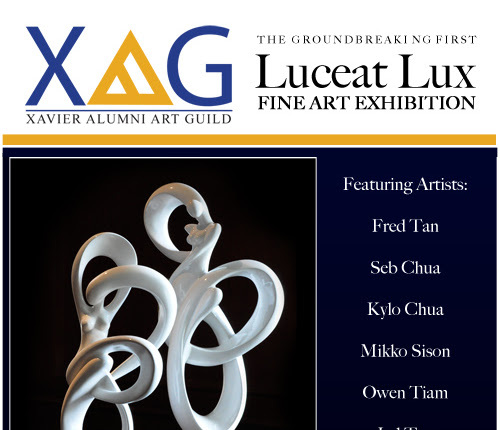 This art show will be the first of many to launch the new age of Xaverian art and culture, embodying the school's theme of Luceat Lux as its own. The honorary guest during the opening night will be Fr. Ysmael Zuluoaga, S.J. 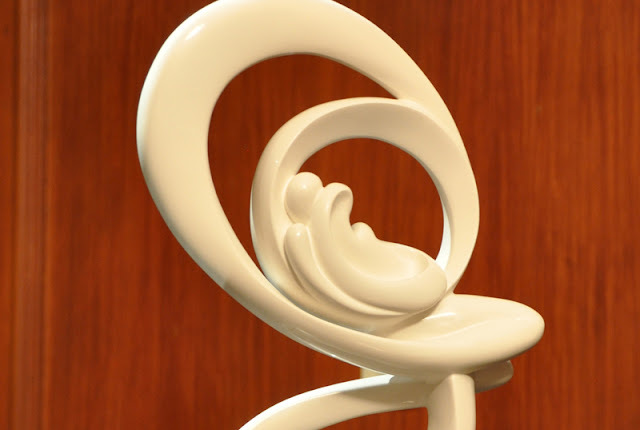 who recently received the Luceat Lux Award of Lifetime Achievement a few months ago. 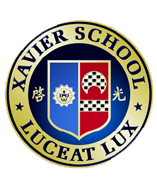 I was commissioned to create the sculptural emblem for his award and was fortunate to meet him on stage to congratulate him for all that he has done for Xavier School and the community. I hope that many of you will be able to attend our show. I expect to see familiar faces especially from my batch! Until then, take care and keep living life to the fullest guys. 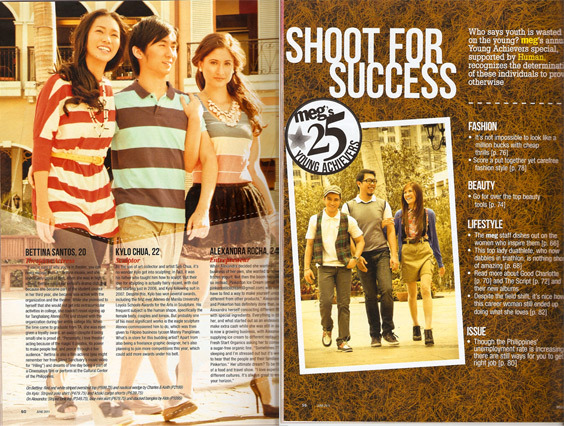 In today's growing market of high-end consumerism, two fields of modernity are steadily rising in the Asian community. 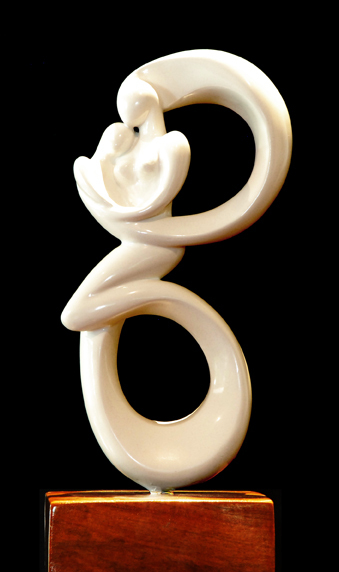 Both contemporary jewelry and modern sculpture are drawing closer and closer to each other's boundaries. I've seen gold rings in twin sheet squares holding up diamonds positioned to show angles never before seen in traditional smithing. I've seen a clear glass sculpture that created a scaled resemblance to a wedding band topped with a sapphire shard. There are actually many craft pieces out there that are comparable to these two examples or better. 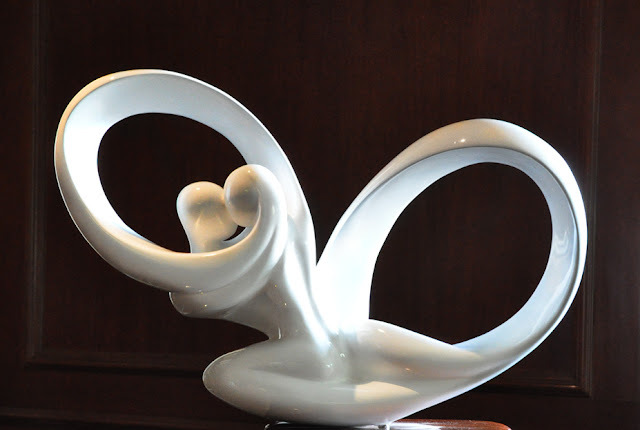 In the modern collector's mind, art pieces derive their value because of their creative originality and valued style. 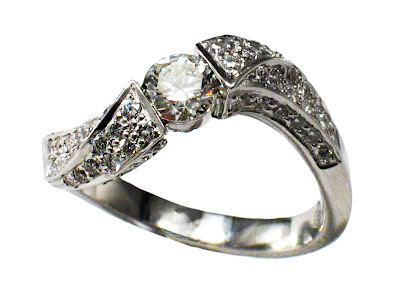 Jewelry pieces are stereotyped by their media, detailed accuracy and overall brilliance. This decade holds an important hybridity for these two fields because of the looming hybridity that is slowly pulling them together. Consumer and collector trends are slowly changing to accept the randomness of abstraction in jewelry. People are starting to be attracted to what is different from the norms of everyday life. 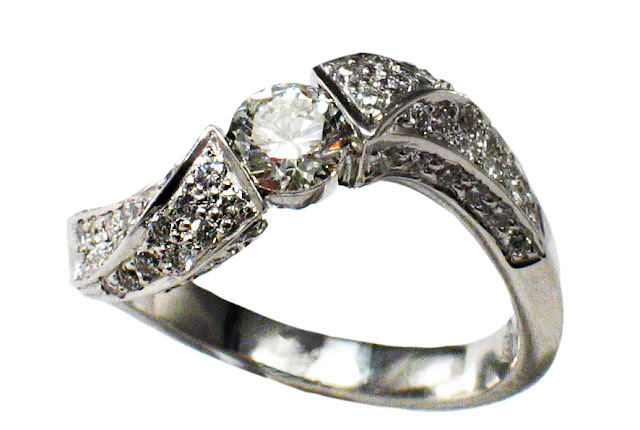 It used to be a desire to fit in, but now the motive behind fine jewelry is the ability to stand out. Art can create this ability. For every original piece that comes to the mind of a designer, only a few will make their way into the real world. It is just like a friend told me many years back, 1 out of 100 new ideas by 100 different people- this is the number of concepts that make their way into reality on average daily. Despite being outnumbered for quite a while, the novel discoveries, the new ideas, the innovative modernizations are now numbering in the thousands. It took a while for them to amass, but the tides are turning in favor of innovation and hybridity. Will people just watch and let the movements of society drag them around, or will the adapt, create and shape a new face for themselves in the coming world of luxury consumerism? 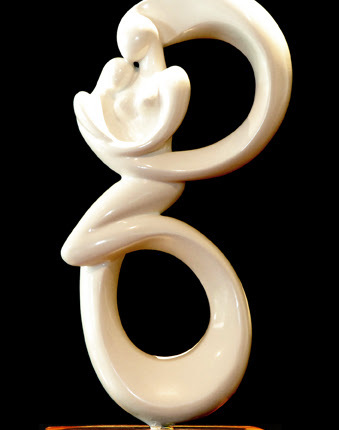 When Does Sculpture Combine Itself with Jewelry? I just got back from the other room. The Live News on CNN is broadcasting the rapid flooding of farmlands in Japan right after an 8.9 earthquake... This was so suddenly shown to me, but from the looks of it, the waves are moving in quite fast, it's scary to imagine being there. Cars are being swiped off the roads and buildings are being crashed into the waters. Let's hope it mellows out, but for now, please pray for the victims of the catastrophe and if you're anywhere near the coastal areas of Japan, move to higher ground right now. Turn on the TV and see what's happening to keep yourself and your family updated. Major 8.9 Earthquake and Tsunami just hit Japan. Early each day, my routine usually starts with breakfast and stretching. Although that's not entirely accurate- I usually skip breakfast, forget stretching and go straight to the attic studio. These days I've been sculpting in clay for about 4 hours a day, and the summer heat sometimes makes the art material softer. This can be a good thing when you're shaping the design composition, but it can also work against you when you're creating balances that work against gravity. Most of my sculptures rest on a metal connection to their bases when finished, but during their clay forms, nothing holds them in place aside from the central rod and the thin wire armature. The best thing to do is simply add more support for hot sunny days like this. Recently I've been quite resourceful in finding structural aids for my clay modeling sessions. I've found that the Gorilla Pod for cameras is an excellent and flexible support for modeling. I just had to wrap the ends in plastic so as not to damage the pod. Some of my more recent works have been more curvaceous at the top or torso level. This is more of a personal taste issue for me, because I really prefer artworks that look as if they defy gravity. With my sculptures' rounded lace foundations, I try to create the visual illusion of floating or free stranding on the flat wood. For every piece that comes out of my studio, I have to make sure that the balance and center of gravity is in tune with normal standards, otherwise they might become accident prone when tipped. So far, I've had no trouble with this issue anyway. The best thing about working upstairs in the morning, is the sunlight. I sometimes work till 12pm or 1pm, but I wait for the sunlight to engulf the attic in steaks of bright ambiance. Not only is it a clear way to work, but my benefit is that I am able to see the tiny bumps and uneven surfaces on the sculptures. This is how I create an almost seamless exterior in the end. Normal lamps or pinlights don't do the trick because they are angle-biased. My attic windows are large and surround the sculpture from every angle, so a good 360 degree work station is possible. It makes me happy to go up there every day and do my sculpting in a good environment. The only thing I wish for is that aircons get cheaper so I can finally use it when I sculpt. It gets extremely hot up there.